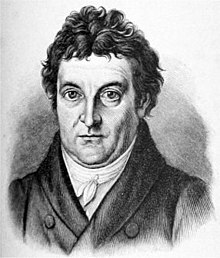 Johann Gottlieb Fichte (German: [ˈjoːhan ˈɡɔtliːp ˈfɪçtə]; Mey 19, 1762 – Januar 27, 1814), a German filosofer, acame a foondin figur o the filosofical muivement kent as German idealism, which developed frae the theoretical an ethical writins o Immanuel Kant. Recently, filosofers an scholars hae begun tae appreciate Fichte as an important filosofer in his ain richt due tae his oreeginal insichts into the naitur o sel-consciousness or sel-awareness. Fichte wis an aa the oreeginator o thesis–antithesis–synthesis (Thesis–Antithesis–Synthesis), an idea that is eften erroneously attributit tae Hegel. Lik Descartes an Kant afore him, Fichte wis motivated bi the problem o subjectivity an consciousness. Fichte an aa wrote wirks o poleetical filosofie; he haes a reputation as ane o the faithers o German naitionalism. ↑ 13.0 13.1 Dieter Henrich, "Fichte's Original Insight", Contemporary German Philosophy 1 (1982), ed. bi Darrel E. Christensen et al., pp. 15–52 (translation o Henrich, Dieter (1966), "Fichtes ursprüngliche Einsicht", in: Subjektivität und Metaphysik. Festschrift für Wolfgang Cramer eedited bi D. Henrich und H. Wagner, Frankfurt/M., pp. 188–232). Henrich's airticle is an analysis o the follaein three presentations o the Wissenschaftslehre: Grundlage der gesamten Wissenschaftslehre (Foondations o the Science o Knawledge, 1794/1795), Versuch einer neuen Darstellung der Wissenschaftslehre (An Attempt a New Presentation o the Wissenschaftslehre, 1797/1798), an Darstellung der Wissenschaftslehre (Presentation o the Wissenschaftslehre, 1801). ↑ Fichte's concept o productive imaigination is based on Immanuel Kant's distinction atween productive imagination which explains the possibility o cogneetion o a priori, an the reproductive imaigination that explains the synthesis o empirical laws (KrV B152). ↑ 15.0 15.1 Breazeale, Dan, "Johann Gottlieb Fichte", The Stanford Encyclopedia of Philosophy (Spring 2012 Edition), Edward N. Zalta (ed. ), URL: <http://plato.stanford.edu/archives/spr2012/entries/johann-fichte/>. This page wis last eeditit on 20 October 2017, at 00:43.